Back to nautical terms. 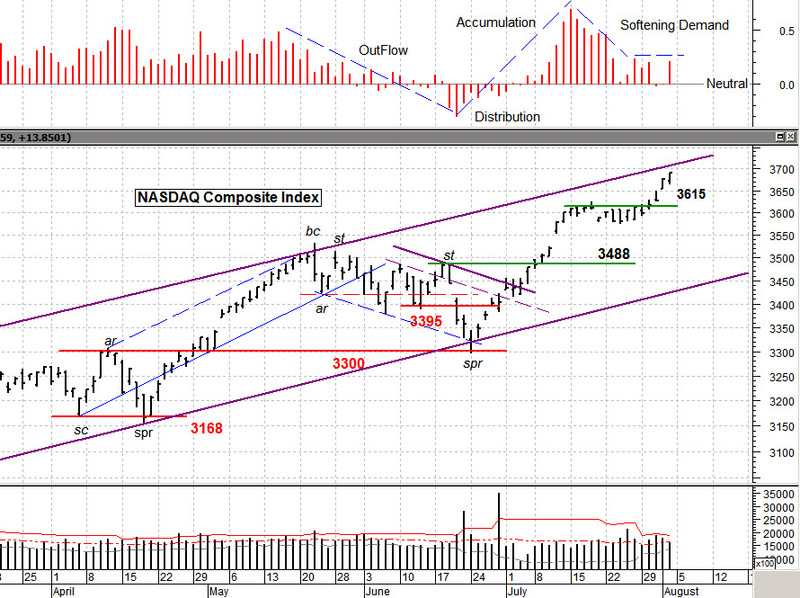 🙂 But really, take a look at the chart below of the NASDAQ Composite Index. The Bull run that started waaay back in November, 2012 continues to march higher within the price channel (drawn in blue). We do get pull backs as value gets ahead of itself at the upper channel and the price retreats to the low channel, but the overall move continues higher. How low can this go on? No one (I mean no one) knows for sure. Certainly the monetary policies of the FED and other world banks have a significant effect, but folks trying to predict that have been made to look rather foolish. At the top of the chart is a ‘Money Flow’ indicator and shows modest demand. And in my opinion that modest demand, driven by average volume, is a healthy sign. What scares me is price rising, on wide daily ranges bars, on high volume. I know it sounds crazy but in Wyckoff terms that is not a healthy advance. I’d prefer slow and steady price moves higher on average volume (Thank You very much). You see volume coming into a market, especially after a significant rise in prices, indicates Supply (shares) entering the market. i.e. Someone is selling into that rally. High volume = institutional selling; and I for one don’t want to be there ! Folks often ask me: “Is high volume Bullish or Bearish?” The answer is “Yes”. It can be either, it all depends on the context (background) of the price structure that it occurs in. After this run, I’d be very concerned about high volume with wide upward moving bars, especially if that happen in two or more consecutive days. Some one is selling, and selling big time (and it’s not to pay for college tuition either). Take’s it for this week. For those who want a broader view of the markets and economy, plus see the latest sector strength, Price Strength and Money Flow charts, please click on the Newsletter tab. The August issue was just posted and downloadable in pdf format.